An employee at a Philadelphia hospital has lost her job over racially charged comments made on social media. A screenshot of the Facebook post from Diane Amoratis started circulating on the social network this past week. The post addresses a recent Black Lives Matter protest in Philadelphia's 24th and 25th police districts. Several demonstrations have taken place in the city following the recent police shootings of black men in Louisiana and Minnesota. "Especially the officer who stood there while that fat, braided hair piece of s*** trouble maker ranted so despicably in your face." "Blacks kill each other every day, all day long, and it's ok with them. Why no protest when Jamal kills Kalif???? Well, I AM WHITE AND PROUD TO BE WHITE!! WHITE LIVES MATTER!!!! POLICE LIVES MATTER!!! Keep your circus in your own neighborhood!!! Get a life, a honest job, and RAISE YOUR KIDS TO BE PRODUCTIVE CITIZENS!!!! I am sick and tired of all this bulls*** with the black people!!" 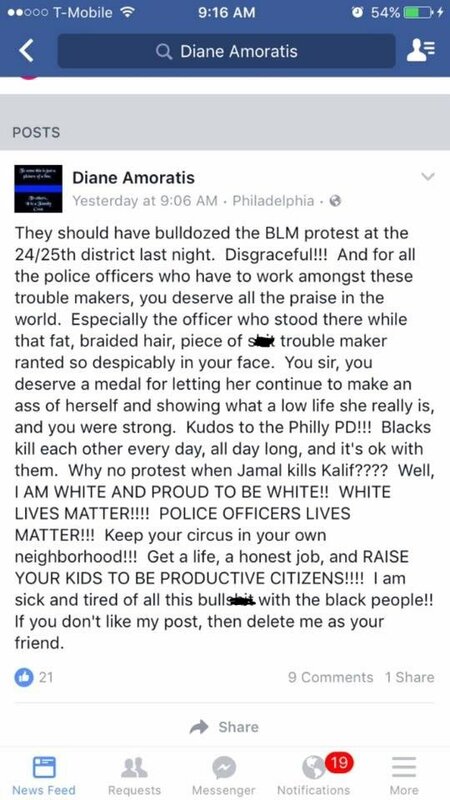 This racially charged Facebook post from Diane Amoratis, a registered nurse at Jefferson Hospital, led to her losing her job. In response to the post, a Change.org petition was launched that identified Amoratis as a nurse at Jefferson. The petition urged the hospital to fire Amoratis, arguing that her "societal position as nurse limits her to public statements of hate." 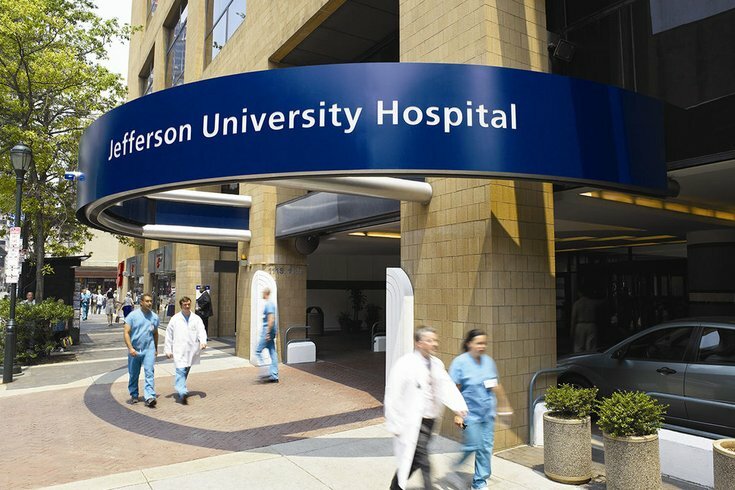 A Jefferson spokesperson said in an email Wednesday that Amoratis was not a nurse at Jefferson, but did not immediately respond to requests for more information about Amoratis' position. "Diane Amoratis (is) entitled to her own opinion but she should not be able to share strong feelings of hate towards a population in which she is in contact daily," the petition read. Infrequently Asked Questions: How does Pokemon Go's augmented reality work? On Tuesday, Jefferson said on Facebook that officials had become aware of the post. President and CEO Stephen Klasko and Chief Human Resources Officer Jeffrey Stevens followed with a statement that said they do not tolerate hate speech. "An employee’s decision to post inflammatory comments on social media is an unfortunate choice and one that is not tolerated at Jefferson," the statement read. "Whether we choose to acknowledge it or not, we must recognize that what we say on social media can directly affect how people perceive Jefferson — particularly when those comments put into question Jefferson’s commitment to the care of our patients, treatment of our fellow colleagues and education of our students." The statement did not explicitly state whether Amoratis had been terminated or not, which sparked even more outrage in the post's comment section. This prompted a follow-up statement Wednesday from Stevens, who clarified that Amoratis was no longer with Jefferson. Stevens stressed that Amoratis' words did not represent the many employees at Jefferson. "I have experienced very personally, dozens of examples of employees who have selflessly given of their time and resources to ensure the comfort and safety of their patients, as well as their colleagues – staff who buy shoes for the homeless, employees who donate their time to refugee shelters or travel to Haiti to serve others less fortunate. These examples showcase the behaviors that truly define the Jefferson we all know." He further urged Jefferson employees to avoid "egregious, hateful language and behaviors." A call seeking comment from Amoratis on Thursday afternoon was not immediately returned.